Il Financial Times ci dedica un'approfondita analisi che identifica una serie di CAUSE del Declino di Fallitaglia: è un'analisi molto utile per capire come il fenomeno sia complesso e multi-causale. = il Paese - in Declino da 35 anni - è praticamente irriformabile perchè non c'è nessuna spinta maggioritaria ad evolvere + ad adattarsi al nuovo contesto globale...anzi... al contrario si va nell'esatta direzione opposta del necessario. 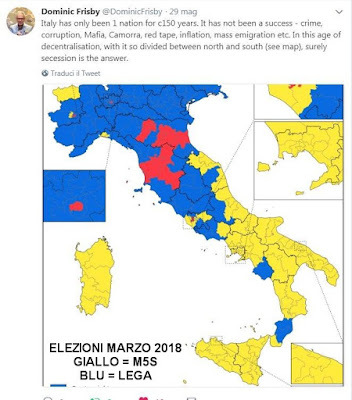 La via per invertire il Declino ci sarebbe, però non solo nessuno la vuole ma comporterebbe agire su almeno 10-15 palle al piede CONTEMPORANEAMENTE, altrimenti l'effetto dei cambiamenti sarebbe molto ridotto se non NULLO. 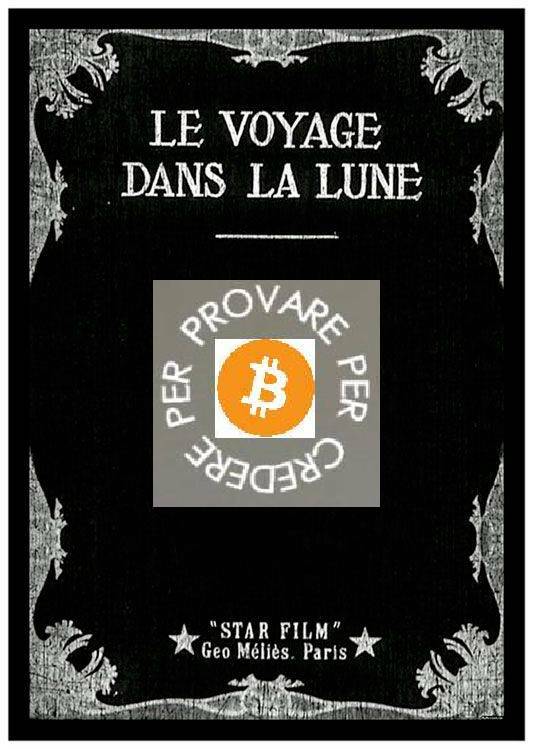 Dunque il Declino - che sia in versione ellenica od in versione venezuelana - non può che continuare almeno fino al Default. Vi lascio alla lettura dell'analisi del Financial Times sottolineando che mancano alcune cause fondamentali del Declino. 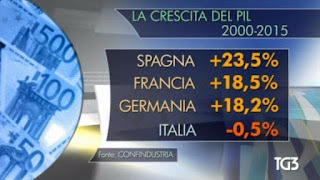 Mancano le tasse da record mondiale ad un 70% reale (che però sono collegate indirettamente a molte della cause elencate). Manca il Declino prima di tutto mentale&culturale che si basa su una maggioranza italopiteca illiberale statalista assistenzialista ideologizzata fuori dal mondo collettivista nemica del business del mercato della produzione di ricchezza dello sviluppo della crescita delle innovazioni della meritocrazia...piena di invidia sociale e con un record di analfabeti funzionali. Why is Italy’s economy so sickly and has the country’s new government found the cure for its economic ills? 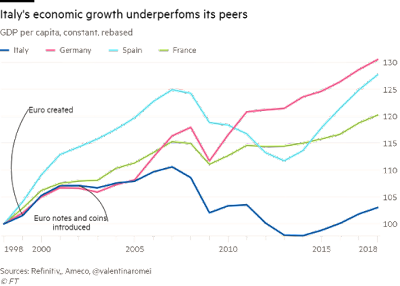 As Rome locks horns with Brussels over a draft Italian budget that the European Commission has rejected for breaching EU rules, the Financial Times has consulted leading economists, academics and industrialists about the root causes of the country’s sluggish growth. The experts’ answers, ranging from corporate culture to public debt, provide little backing for the Italian government’s case that its plans to increase the fiscal deficit to up to 2.4 per cent of gross domestic product will kick-start growth after years of poor performance. 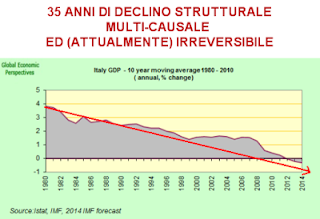 The challenge facing the Italian government is to get Italy out of the slow or no-growth trap it has been caught in throughout this century. 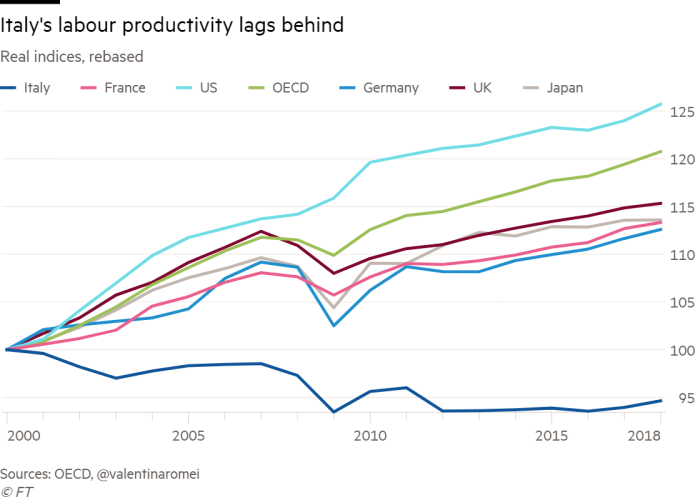 Growth has stalled, leaving the country’s economic output still 5 per cent below its pre-crisis peak of 2008. Italy and Greece are now the only EU countries that have failed to recover to the levels of 10 years ago. GDP per capita is today, when adjusted for inflation, less than in 2000. The data highlight the country’s mediocre economic performance since the introduction of the euro in 1999-2002. Eurosceptics, some of whom are close to Italy’s populist coalition government, often blame the single currency for the economy’s ills, arguing that devaluation could kick-start exports. But the broad consensus among economists is that the country’s problems are due to structural weaknesses, rather than the euro. So why has economic performance been so poor? Here are the findings of the experts consulted by the FT, beginning with the most frequently mentioned possible causes. 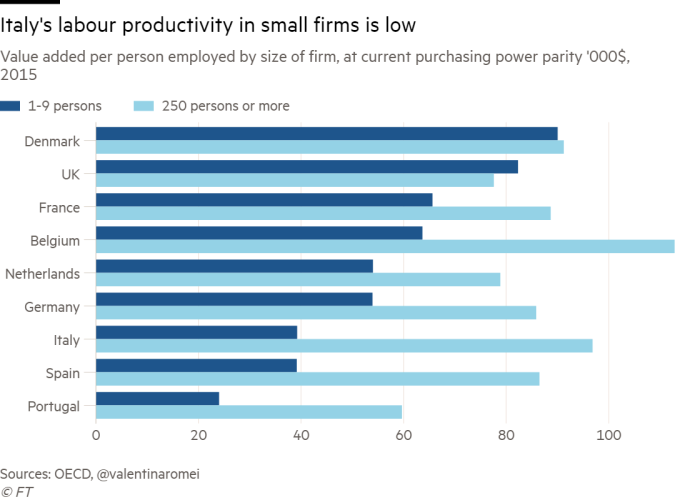 Italy’s economic model is very dependent on family-owned companies that are typically smaller and less productive than their equivalents elsewhere. This problem has grown worse in recent decades. 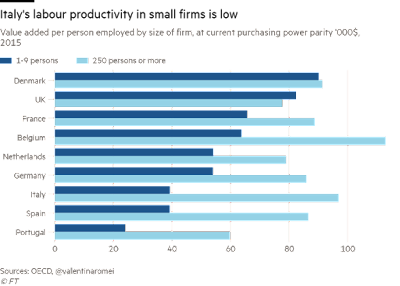 “In the 1970s and early 1980s, the Italian business model of small and medium-sized enterprises drove growth,” Silvia Ardagna, economist at Goldman Sachs, said. But, she added, many of those companies “did not invest in R&D and lacked the management capabilities and human capital to allow them to compete on a global scale”. According to the European Commission’s SME tracker, 95 per cent of Italy’s businesses have fewer than 10 employees. 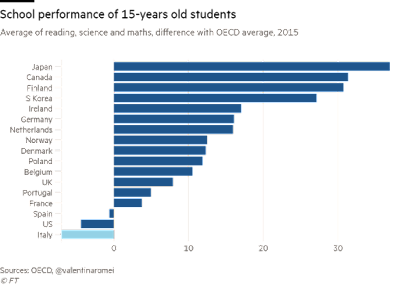 OECD data show Italian companies of that size have lower levels of labour productivity than their peers. Bigger companies also fail to innovate, whether because of traditional, change-resistant, family ownership or difficulty obtaining credit. The latest OECD economic survey of Italy showed that contrary to the experience of most of the organisation’s member states, productivity among the most efficient companies in Italy is declining even faster than among the least productive ones. Despite a government initiative in 2016 to encourage companies to increase their digital presence, fewer than one in 10 non-financial businesses in Italy sells online. This is the third-lowest share in the EU after Romania and Bulgaria, according to Eurostat, the bloc’s statistical agency. The Italian government’s draft budget allocates very limited resources for dealing with such issues, planning no increase in the funds available to help companies with digital transformation for 2019 and only a minimal rise in 2020. 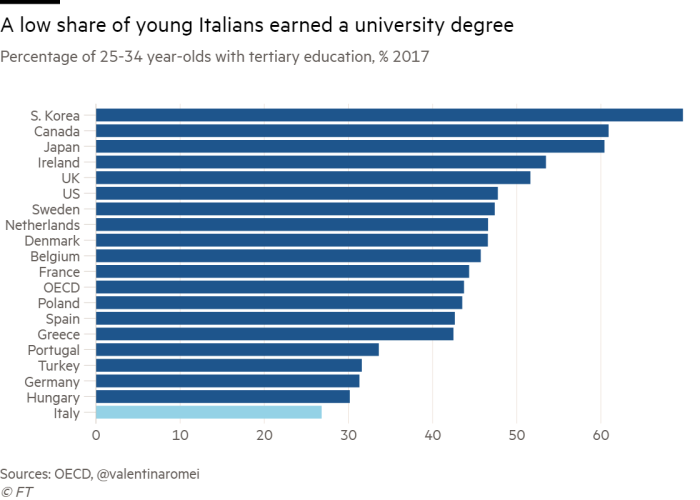 The experts cited Italy’s dysfunctional educational system as second only to the problems with business culture and industrial modernisation. “The highly centralised and unionised educational system delivers poor results in terms of actual skills,” said Massimo Bassetti, an economist at FocusEconomics. 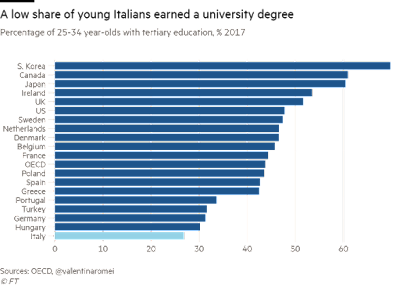 Fewer than one in three 25-34-year-old Italians has a university degree, well below the 44 per cent OECD average. Italian 15-year-olds have lower maths, science and reading performances than most of their peers, according to the OECD PISA report. 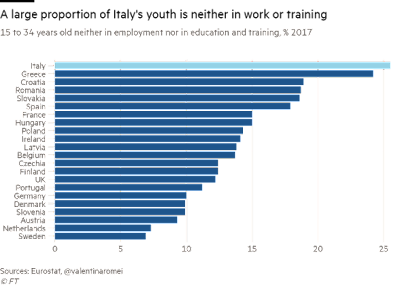 Italy also has one of the highest student dropout rates in the OECD, and about one in four Italians aged 15-34 are neither in work nor education, the largest proportion in the EU. 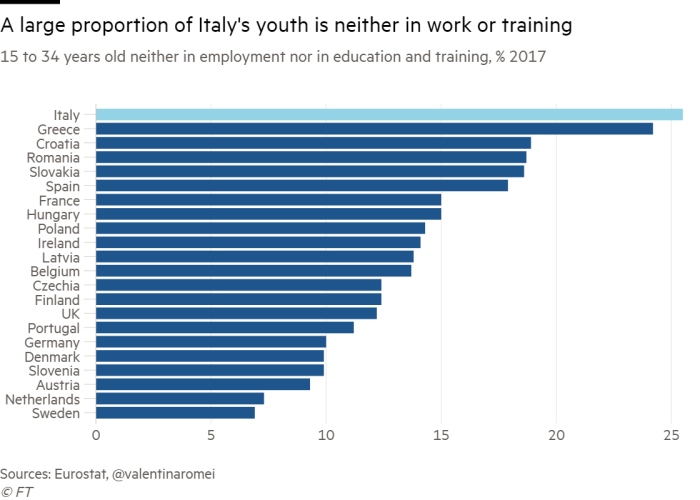 Italy’s budget plan contains reforms such as expanding pre-school education, changing teacher recruitment and reducing dropouts from school, but they are not among measures receiving significant additional funds. Italy scores poorly on most measures of government efficiency and satisfaction with public services. The country ranks 111th out of 190 countries globally for ease of enforcing contracts, according to the World Bank ease-of-doing-business index. 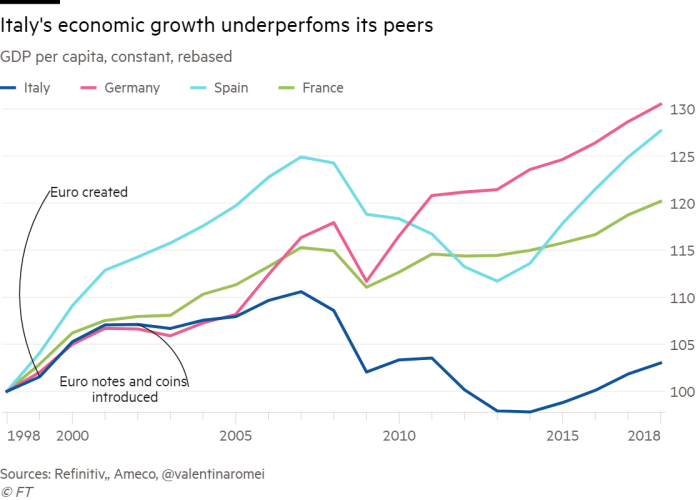 Italy scores just as poorly on bureaucracy for resolving insolvencies, paying taxes and dealing with construction permits. 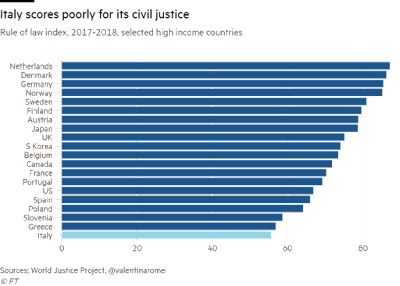 The country’s civil justice system is also ranked second to last among 35 high-income countries as measured by the World Justice Project. 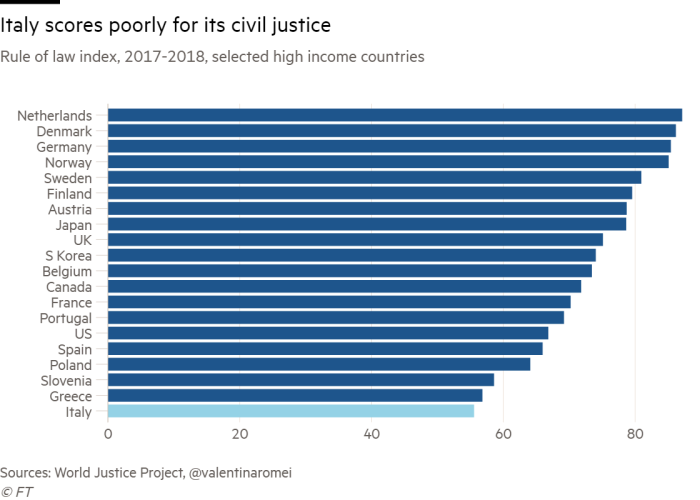 “In Italy it takes far longer than in other developed countries to conclude civil and criminal trials,” with consequence for the business environment, said Mauro Pisu, senior economist at the OECD. “Inefficient public administration effectively acts as an additional cost on businesses, holding back investment and growth,” said Ms Ardagna. “Italy’s complex tax code, Byzantine regulation and inefficient public administration” are a “handicap”, said Mr Bassetti. They also prevent foreign companies from investing in Italy, said Andrea Colli, professor of business history at Bocconi University. 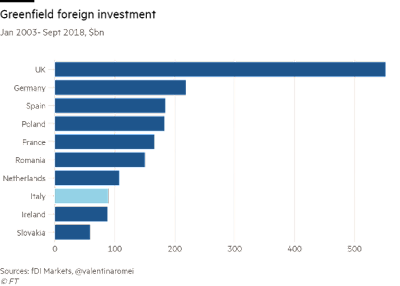 Italy is a larger economy than Spain but has received less than half the level of foreign greenfield investment since 2003, according to fDi Markets. In his letter to Brussels, Giovanni Tria, Italy’s minister of finance, wrote that future structural reforms, including the reform of the Civil Code, would “stimulate economic growth, ensuring the long-term sustainability of Italy’s public finances”. Italy’s coalition government argues that its spending plans will help fuel growth. 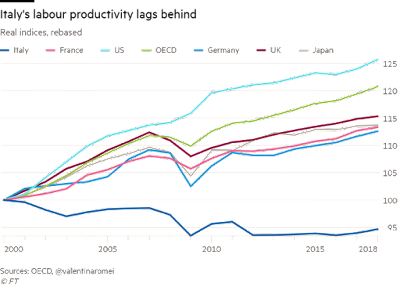 But many of the experts consulted by the FT argue the contrary: that high debt levels already crowd out growth by attracting funds for government paper that would otherwise go towards more productive investments. “High public debt has limited the resources that have been devoted to the productive sector of the economy,” said Ms Ardagna. 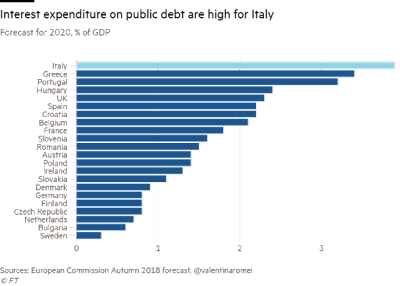 With the EU’s second-highest debt-to-GDP ratio, Italy spent 3.7 per cent of its GDP on debt interest, double the average of the EU. The European Commission’s latest forecast expects this to rise to 3.9 per cent by 2020 as a result of higher bond yields and interest rates. 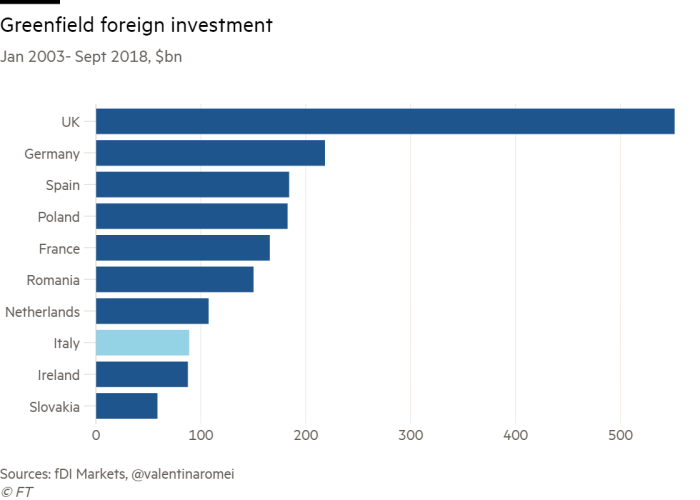 “Italy’s debt burden absorbs substantial financing resources, reducing funds for infrastructure investment and crowding out business investment,” said Mr Bassetti. 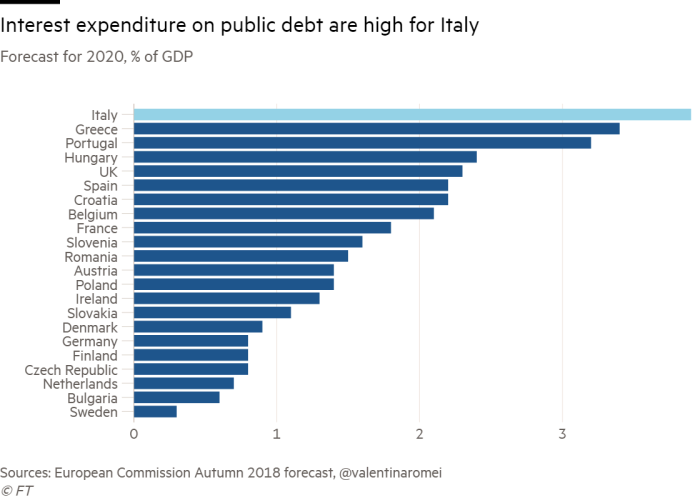 While under the draft budget Italy will allocate additional funding of 0.2 per cent of GDP to public investment in 2019 and 0.3 per cent in 2020, analysts are not expecting significant improvement in its overall structural weaknesses. “Our baseline scenario remains that the new government won’t give the economy the needed reform push to jolt productivity,” Nicola Nobile, economist at Oxford Economics, said.